100-Series High Resistance Standards | Ohm-Labs, Inc.
Ohm-Labs is the leader in guarded high resistance standards, the first to manufacture this design commercially, and the most experienced, wtih hundreds of these standards successfully built and delivered to labs around the world. 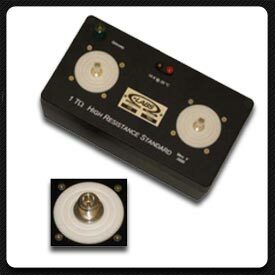 The 100-series guarded high resistance standards are designed for laboratory or on-site calibration use. Their low coefficients of temperature allow them to be used in a variety of environments without loss of accuracy. Hermetically sealed construction provides immunity from changes in barometric pressure and relative humidity. They are not affected by moderate vibration or shock. Low reactance allows their use as DC or AC standards. All models are housed in a rugged, die-cast aluminum case. Connection is via either male silver plated British Post Office (BPO) plugs or type N jacks (specify at time of order). The shields are for a guard circuit driven at measurement potential. Either terminal may be high. BPO adaptors are available. The guards are internally connected by a high value resistor nominally equal to the standard. This provides balanced guard voltages for any type of measurement system at any ratio. A 5-way insulated binding post for banana plugs or spade lugs is provided for grounding the case. A 10 K (nominal, at 25 °C) thermistor is included to monitor the internal temperature of the standard. Connection is via standard 2 mm banana plugs. Optional accessories include BPO to BNC adaptors (male or female), and BPO to BNC adaptor cables. Decade resistance values are standard; other values are available on request. All models include ISO17025 accredited calibration at two voltages and temperature coefficient determination. Tolerance is at time of manufacture. Temperature coefficient is at nominal 23 °C +/-5°C.